April | 2012 | Ding! How can we trigger innovative thought, consistently, deliberately and when we need it? One way is to use the power of a simple question. It’s a question at the heart of creativity, invention and imagination. It’s the force behind all creative storytelling, especially Science Fiction which can be defined as ‘What If?’ extrapolated into a story). The question ‘What If?’ can be thought of as an energy field that can power our creativity. Just like most energies, it can be used to manifest both positive and negative effects with very different results. The qualifying factor to the question is how we relate it to time. But if we apply it to the future it fires our possibility thinking and leads, either directly or indirectly, to hope. If we imagine an undesired outcome in the future, our brains begin to work on methods to prevent that future coming to past, or at least find the path of least damage. Imagining even our worst fears of the future gives us hope because we are still in the present with some chance, however small, to shape and even change the future. If we imagine a desired outcome, our brains begin to fill in the gaps to speed the passage of the present into the desired future by directing our subconscious to incubate the problem until solutions or opportunities present themselves. The application of ‘what if?’ fires the imagination and problem solving capacities of the brain and that imagination begins to manifest the emotions of the outcome. This isn’t an application of the supernatural, so-called ‘law of attraction’. This isn’t about asking the universe, or God, or wishful thinking. This is the relatively simple neuroscience of the imagination. Negative emotions based on regret will slow us down, but positive emotions based on desired outcomes, hope and wonder, will drive us and motivate us to seek out and manifest the desired outcome. Wondering ‘what if?’ defines us as scientists, exploring the universe of possibilities. Taking action on those possibilities to manifest an outcomes makes us artists. It’s this blend of being both artist and scientist is what it means to be a creative mind. By aydinstone  Posted in Creativity, Speaking	 Tagged imagination, innovation, leadership, possibility thinking, questions, science, what if? You think you know about the so-called Left and Right brain? Left is logic and Right is arty? Right? What if the two hemispheres operated as two almost separate brains, two almost different individuals? Today we are beings that have a single identity, our two brains work together to create a consciousness we describe as ‘me’. What if there was a time, many thousands of years ago when, some psychologists have proposed, that mankind did not have the same kind of consciousness that we have today? Almost all modern humans today have free-will governed by a stream of consciousness thought conversation that appears to be in our heads. Our heads appear to have a silent, private place where we can weigh up decisions and think through thoughts. Instead of this, ancient man may have been unable to weigh up decisions and not had this internal space. 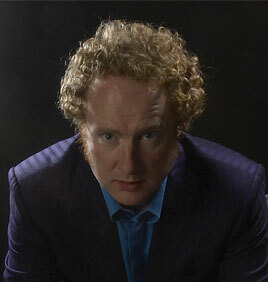 Julian Jaynes (1920–1997), a psychologist at Princeton University, USA, proposed in 1977 in his controversial but critically acclaimed book The Origin of Consciousness in the Breakdown of the Bicameral Mind that humans operated under a previous mentality he called the bicameral (‘two-chambered’) mind. In the place of an internal dialogue, bicameral people experienced auditory hallucinations directing their actions. These hallucinations were interpreted as the voices of chiefs, rulers, or the gods. The Left and Right brains provided an external voice and an externalised voice. With no internal dialogue, the ‘bicameral’ man would have had to talk out-loud, and not to himself, but to his other voice which he would have heard as if it was external and separate from himself, outside his head. This external voice, originated in his right hemisphere, would communicate decisions and information to him which he heard as auditory hallucinations. Today, some people still do hear voices telling them what to do. We label them as schizophrenic. If the voices they hear tell them positive things the person tends to think of the voice as coming from an angel (and does not often report the fact). If the voice is negative and nasty people often seek medical advice and label the voice as demonic. (Various studies suggest that 4% of the population regularly hear voices today). In a civilisation where everyone externalised their inner voices, the society was used to living amongst angels and demons, or good and bad gods. Their world was structured by individuals responding to the voices of their own personal gods, giving them orders and telling them what to do. We have written accounts that many people not only hallucinated voices, but many actually saw their gods too, sometimes as humanoid beings, sometimes as anthropomorphised animals or talking objects. Some civilisation worshiped the dead, decorating their bodies and brining gifts. They did this not out of loss for the deceased, but because the dead person would still be talking to them and still giving orders from within their crypt. Such societies were highly organised in strict pyramidal chain of command structures. When the bicameral mind broke down, perhaps due to stress from some natural disaster, those people were left lonely and scared. Jaynes puts the development of modern consciousness to around the end of the second millennium B.C. in Greece and Mesopotamia with the transition occurring at different times in other parts of the world due to local events or clashes with non-bicameral groups. An example is when the Spanish invaded South America and the bicameral Aztec civilisation collapsed overnight. The newly conscious people could suddenly no longer hear the voices of their gods and didn’t know what to do. They had no orders to follow but an overwhelming desire to follow. They sought solace from those that could still hear the voices and obeyed their orders instead, setting them up as oracles. When these sought-after individuals became scarcer they were given even more power and priesthoods were invented. Eventually only the insane or a few rare prophets heard voices at all. Some of the priests would turn to narcotics and rituals to invoke what connection with the gods that they could and would attempt (often successfully) to hear the voices. Then, for most people, with no reliable connection with the gods was available, the societies had to rely on faith in the old stories and start to guess what the gods may desire them to do today. With the leadership structures still identical to before, things could continue as before, albeit with laws now having to be mutually agreed and the requirement for law enforcement. The old bicameral command structure is still used in an almost identical way in most religious orders, armies and dictatorships today. Anywhere else, the system doesn’t work with non-bicameral brains as non-bicameral people will think for themselves and often question orders. This has become even more prevalent in the last 50 years, since the end of the Second World War in the West, where the youth have grown up with less and less command structure in their lives. Many people today lack the ability and discipline needed to follow orders as well as a lack of faith in authority, whatever it’s source. In our wholly post-bicameral age, the voices of the gods are long silent. We need a different kind of leadership based on example setting and inspiration if we are ever to work together again. In our modern complex world we tend to think that all the best ideas have been thought of. History proves that is never the case. Here are 7 inventions that were invented one hundred years ago, in the year of 1912. (Click here for 1913) All of them are still relevant today. Also with all of them, the technology for their operation was already in existence and had been for some time. So they could all have been invented 1, 10 or maybe 50 years earlier. But weren’t. Most of us don’t invent anything much in our lifetimes. Part of that reason is that we think of invention as grandiose and that we’d need to invent time travel, teleportation or anti-gravity to have invented something worthwhile. Inventors don’t think like that. Instead they look at a problem, a real problem that they or other people they know actually have. Their inventions are solutions to those real life problems. The kitchen worktop surface was invented by Daniel J. O’Conor and Herbert A. Faber who originally conceived it as a substitute for mica used as electrical insulation. It was made of wrapped woven fabric coated with Bakelite thermosetting resin, then slit lengthwise, flattened, and cured in a press. Because the new product acted as a substitute “for mica”, Faber coined the name “Formica”. Invented by the American physician Sidney I. Russell. A Swede, Gideon Sundback, working in America, invented the zipper. Chocolate pieces filled with a soft fondant center were invented by Jean Neuhaus II, a Belgian chocolatier. 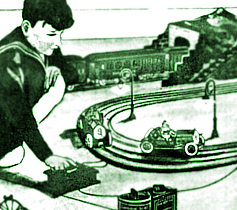 The first commercial slot cars (now most famously made by Scalectrix) were made by the Lionel model company in the USA, drawing power from a toy train rail sunk in wide slot between the rails (see pic). The first traffic controlling light was invented in by a Detroit policeman named Lester Wire as a two-color, red-and-green light with a buzzer to warn pedestrians ahead of the impending change. Baron Pierre de Coubertin, the founder of the modern Olympic Games invented the modern Pentathlon which was was first contested at the 1912 Summer Olympics in Stockholm. We should all be focusing on real life problems within our own spheres of interest and work on how to solve them. Perhaps we too could come up with a solution that would benefit the world. Don’t get bogged down thinking there’s nothing left to invent. At every point in the history of civilisation where people thought ‘everything that could be invented has been invented’ – it has always been soon followed by an amazing era of progress and invention. They’ll be nothing left to invent when the world has no more problems to solve. And that’s a long way off…. So have a think. What could YOU invent this year? Can you imagine an idea that will still be in general use in 2112? Have a look at 10 things that were invented the following year, in 1913, here. I finally got my record player plugged back in. I unplugged it in late December to make room for a seven foot Norwegian Spruce that I’d covered in glass balls and low voltage white bulbs. We’d long since thrown that tree away and vacuumed up thousands of tiny needles and now it was time to re-install just one needle in its place. There was an air of anticipation and excitement. My three children gathered around. From a massive pile of 7” black discs, some in paper sleeves with pictures on, some in plain green sleeves, they selected one. Oliver (age 6) slid it out of its cover and I showed him how to place it on the spindle by touching only the edges. I told him to flick the switch on the left to ’45’. I lifted the metal arm over just a little bit and Mabel (age 4) flicked the switch on the right; once to make the platter spin and again to lower the needle into place. We all watched as the disc span round and round at 45 revolutions per minute. A crackling sound, like that of a well established fire came from the speakers. Then, the room was filled with the booming mono sound of the most energetic 2 minutes and 35 seconds ever committed to the physical realm. 49 years ago, a few young men played and sang live in a recording studio in Abbey Road, London, using their voice boxes, guitars and a drum kit. The sound they’d made caused vibrations in the air which caused magnets to create electronic fluctuations along a wire which cause another magnet to re-arrange the rust particles on a lengthy plastic tape into a pattern. Later, another magnet was affected by those magnetic particles from the tape causing low level electronic fluctuations in a wire which were amplified by a complex arrangement of glass vacuum valves to move a diamond tipped needle to vibrate. The needle was held still while a lacquered disc spun round at speed, allowing the needle to carve a spiral on its surface. A mould was made from that lacquered disc and a glass disc was made from the mould. This was then pressed onto millions on lumps of hot vinyl plastic which were flattened into a 7” disc. One of those discs found its way into a shop in mid 1963 and was bought by my Dad. 18 years ago when I got my own house, I liberated it, and now it was here, spinning around in my lounge with my three children jumping and dancing to the sound of the Beatles performing Twist and Shout live in 2012. That record is a time mirror that reflects their sound, via magnets and needles, right here from the long distant, unimaginable so-called past of 1963 to today, here and now. They were with us, alive and happy and infectious. But more important that all that was the fact that my children were dancing and singing. Music was real. They could see it. They could touch it. They could choose it. The past two weeks have seen Oliver become a DJ, going through my collection of singles and albums, intrigued how the large cover images may relate to the secret sounds hidden within the grooves. He’s playing tracks for his sisters to dance to, or draw to, or play to. He wants to be like Ringo and play the drums so he can come with me to my conference performances and provide the beat for my keynote songs. He’s developed an ‘ear’. Some tracks he says are ‘too noisy’ or ‘too sad’. Mabel has lifted the piano lid and is more considerate in which keys she presses. She knows that some combinations are more pleasing than others. Our youngest is just 20 months old. When the records are on she smiles and dances and twirls. It’s an involved process to choose which record to put on. You have to make a decision that will involve some physical activity that needs to be done with great care. The records are precious and fragile, and therefore by association, so too is the music. So once a record is on, it needs to play all the way through. It needs to be listened to, to be engaged with. There’s no easy way to change your mind, or to default to ‘shuffle’. You make your choice and stick with it. Is there a danger, in our perceived search and adopted desire for ‘easy’ and ‘quick’ we are at risk of overlooking the experience altogether? After all, what is music ‘for’? In our instant coffee, free download, always online world, do we rush through the day to get to the evening? Do we sometimes rush through the week to get to the weekend? Do we rush our children through childhood so they can grow up? And rush them through education so they can get some certificates? Do we risk rushing the journey of life to get to the destination of the grave in the easiest and shortest possible time? Do we risk taking for granted the complexity of the human experience in order to dumb it down to effortless chicken nuggets that we can consume on the move? Dust off your own record player (whatever that might be) and put on a record. Choose it. Touch it. See it. Listen to it. Dance to it. Enjoy it. Life is not about the needle reaching the run-out groove in the centre of the record. It’s about the music in between. And by the way. For those of you who read my blogs and take all the metaphors literally: this is not a blog about replacing new technology with gramophone vinyl records. If you thought that, this blog is not for you. You’ll find material better suited to your taste here.